Hope you can join us with Mark Gonzales this coming Monday and Professor Ramon Grosfoguel in December. We are also hosting a year long counter-racist course in London in partnership with the Assata-Tupac Liberation School and SOAS2, and teaming up on other events across the next year. We are also in preparation for the 2014 Genocide Memorial Day and the return of the Islamophobia Awards in February next year. So watch this space for more news on these events. Please remember us in your duas, and consider giving us a donation by any of the methods below. We rely on your contribution to enable us to support victims of hatred and violence. The IHRC newsletter is here, and below you can find details on how to download it and distribute it. Other facets of IHRC’s work have been reported on including our hate crime monitoring activities and research in the UK and USA. Or download a copy of our latest newsletter and fill in one of the donation forms and return to us. 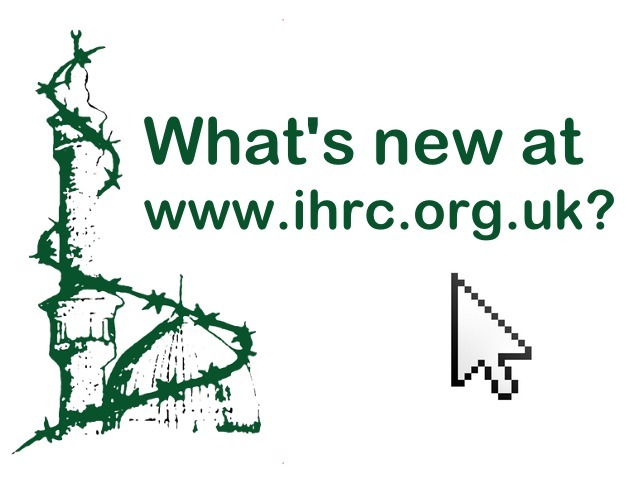 Don’t forget you can follow us on Facebook, Twitter @ihrc or on Youtube channel IHRCtv. UJN facilitates meeting with IHRC in UK and Malaysia, Citizens International. Istanbul is to play host to an important gathering to discuss and suggest ways out of the political crisis in Egypt. Muslim scholars from Pakistan have signed a historic agreement condemning sectarianism and vowing to remove it as a cause of conflict in the violence-stricken country. Meeting in the Turkish seaside resort of Bodrum the scholars, who represent all of Pakistan’s major Islamic sects and tendencies, agreed to come together to tackle religious intolerance in the interests of Muslim unity. IHRC requests ICC to investigate humanitarian crimes in Indonesia; The Islamic Human Rights Commission has asked the International Criminal Court (ICC) to investigate a possible crime against humanity in the Indonesian province of East Java. The complaint relates to a sectarian attack that took place on 26 August, 2011, in which a Sunni mob attacked Shia residents and their properties in the villages of Nangkernang and Blu’uran, located in the Sampang regency of East Java. #visionaryawakening Exhibition @ihrc from 19 September 2013 to 18 February 2014 drop by if you are in the area. IHRC is delighted to host visionary photographer and artist Nasreen Shaikh Jamal al-Lail’s work at its gallery in Wembley, northwest London. Islamic Human Rights Commission offers free weekly Information and Advice surgeries every Wednesday. Our professional caseworkers can provide people with information and advice on a whole range of issues. Our service is confidential, independent and free. Join IHRC on Monday 4 November at 7pm to listen and share with Mark Gonzales. This one night only event is for all you whose head hurts from the amount of bigotry & stupidity that is being circulated in every day conversation. Faculty includes Tariq Ramadan, Ramon Grosfoguel-Salman Sayyid, Houria Bouteldja and IHRC’s Arzu Merali. The Center for the Study of Intercultural Dialogues (Granada, Spain) http://www.dialogoglobal.com/granada is now accepting applications for the 2014 two-week summer institute, Critical Muslim Studies: Decolonial Struggles, Theology of Liberation and Islamic Revival. Moreover, as a strong commitment to a vision of Critical Muslim Studies there are two symposiums organized inside the summer school every year: one on Islamic Feminism led by Asma Lamrabet (Directrice du Centre des Etudes Féminines en Islam au sein de la Rabita Mohammadia des ulémas du Maroc:http://www.annisae.ma/ ) and the other on Radical Muslim Reform led by Tariq Ramadan (Director of The Research Center for Islamic Legislation and Ethics (CILE) in Qatar: http://cilecenter.org/ ). Artist Mohammad Hamza joins us at the IHRC Gallery in Wembley, North West London in March 2014 to showcase his revolutionary arts. Watch this space for more information in the coming weeks. Full set of resources available of this historic meeting. Islamic Human Rights Commission and Citizens International as joint secretariats of Universal Justice Network brough together Muslim scholars and leaders from Pakistan to work on unity issues. At the end o fthe two day closed meeting the group signed a historic agreement condemning sectarianism, vowing to remove it as a cause of conflict in the violence-stricken country. A compilation of resources and links from IHRC in relation to the Schedule 7 and know your rights. UJN Pakistan Unity Declaration 1434 condemning sectarianism. The author uses double consciousness theory in an attempt to understand problems in the contemporary Muslim world. An anti-war activist has accused Britain’s domestic spying apparatus MI5 of seeking to justify the country’s future interventions into foreign states under the pretext of the so-called war on terror. Press TV has conducted an interview with Massoud Shadjareh, with the Islamic Human Rights Commission, from London, to discuss the Muslim ritual of Hajj. A Muslim free school is set to be put into special measures after a damning report called it “dysfunctional” and “inadequate”. Watchdog Ofsted condemned the running of the Al-Madinah school in Derby, which has already been threatened with closure by the Government. Dr Hany el Banna: A Servant to the Worlds Poorest People: Having moved to the UK from Egypt as a young doctor to continue his studies, this story charts Dr Hany El Banna’s steps from fundraising on the streets of Birmingham to being the president of a global humanitarian relief organisation. From underground tunnels in war-torn Bosnia to the tsunami ravished villages of Indonesia, find out what drove Dr El Banna to people in need. The story of his efforts to establish Islamic Relief around the world, is at once a warm, inspiring and occasionally eccentric tale of humanity. History and the Theology of Liberation by Enrique Dussel: Situating Latin American Christendom within world cultures, Dussel traces the development of Latin American Christianity from its origins up to the present day. He discusses a theology based on the authentic self-understanding of a dependent people and argues that it will be different from the theology of the regnant North Atlantic academies. It will be a a theology of the slave rather than of the Pharaoh. America’s Deadliest Export: Democracy – The Truth About US Foreign Policy and Everything Else / William Blum: Since World War II we have been conditioned to believe that America’s motives in ‘exporting’ democracy are honourable, even noble. In this startling and provocative book, William Blum, a leading dissident chronicler of US foreign policy argues that nothing could be further from the truth. Check out our online shop for books and what we currently have in stock.